Lutefisk (lutfisk) is a traditional dish of the Nordic countries and parts of the midwest United States. It is made from stockfish (air-dried whitefish) or dried/salted whitefish (klippfisk) and soda lye (lut). Its name literally means "lye fish", because it is made using caustic lye soda derived from potash minerals. The use of lye to soften a hard, indigestible base is actually a fairly common practice with many kinds of food (such as hominy). 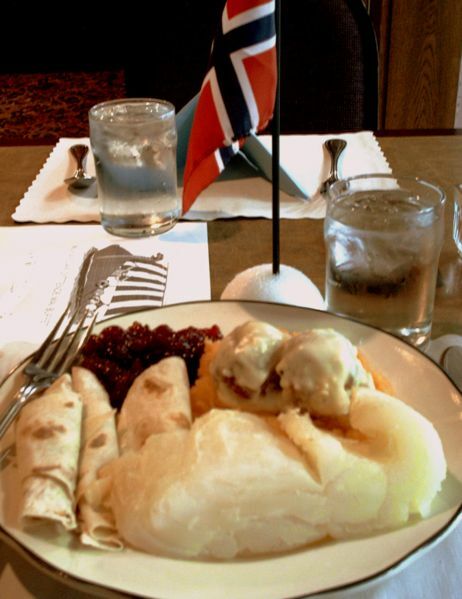 Left: Norwegian Constitution Day dinner in the United States, with lutefisk, lefse, and meatballs. Lutefisk is very popular in Nordic-North American areas of Canada, especially the prairie regions and the large Finnish community at Sointula on Malcolm Island in the province of British Columbia, and the United States, particularly in the Upper Midwest and Pacific Northwest. From October to February, there are numerous lutefisk feeds in cities and towns around Puget Sound. In the Nordic Countries, the "season" for lutefisk starts early in November and typically continues through Christmas. Left: Lutefisk with melted butter. 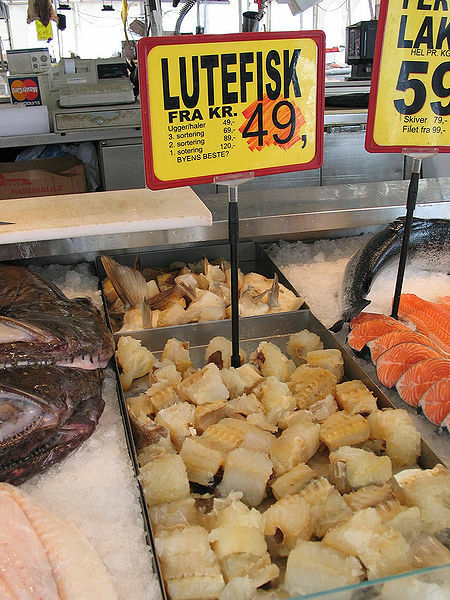 Left: Lutefisk in a Norwegian market. Lutefisk is usually served with a variety of side dishes, including, but not limited to, bacon, green peas, green pea stew, potatoes, lefse, gravy, mashed rutabaga, white sauce, melted or clarified butter, syrup, geitost (goat cheese), or "old" cheese (gammelost). In the United States in particular it is sometimes eaten together with meatballs. Today, akvavit and beer often accompany the meal due to its use at festive and ceremonial occasions. 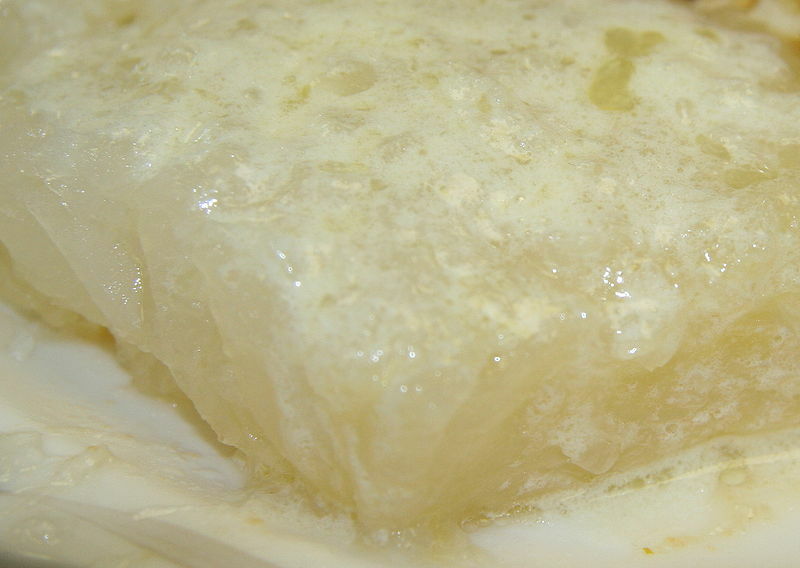 This is a recent innovation, however; due to its preservative qualities, lutefisk has traditionally been a common "everyday" meal in wintertime. Lutefisk prepared from cod is somewhat notorious, even in Scandinavia, for its intense (and to those unacquainted with the dish, offensive) odor. Conversely, lutefisk prepared from pollock or haddock emits almost no odor. The taste of well-prepared lutefisk is very mild, and often the white sauce is spiced with pepper or other strong tasting spices to bring out the flavor.